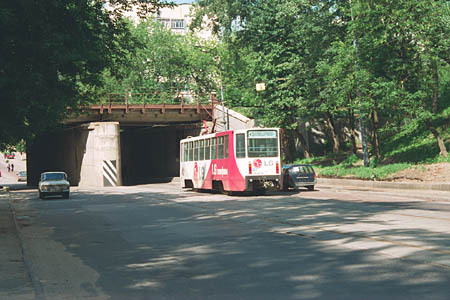 A tramline along Volochayevskaya Street was constructed in 1909 (but the street was named Zolotorozhskaya in those days, reminding of the Zolotoy Rozhok brook). 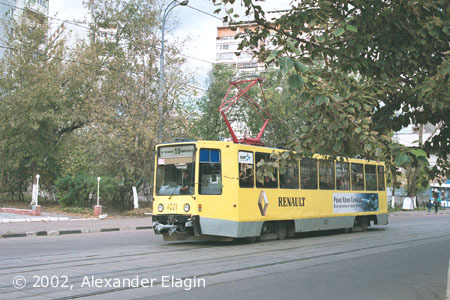 The line connected Lefortovo district with Rogozhskaya Zastava Square. 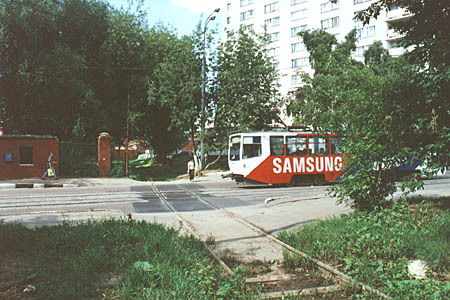 At the same time, Zolotorozhsky Tram Depot was built near this line, and now this former depot functions as a Tram Repair Shop. The depot was closed in 1976; there had been plans to convert it into a trolleybus depot, but instead it was decided to use its infrastructure to handle regular tramcar servicing and repairs. A crossroad of Andronyevskiy Proyezd and Gzhelskiy Pereulok. Here Volochayevskaya Street begins. There are many old houses here, and these buildings have survived the radical reconstruction of the district - signs of the reconstruction loom behind the trees, being huge buildings along Sergiy Radonezhskiy Street. As you can easily see on this photo, the railway overpass was built at some angle to the street axis; the reason for this strange alignment I cannot figure out. I also cannot guess why the tracks quality is so poor in this place, maybe it has something to do with the steep grade towards the overpass. An old water tower can hardly be seen from the road, because of large buildings that were raised in this street in the last years. And the Tram Repair Shop is located just beyond the white fence. (Here is the Russian version of the page devoted to this interesting object; I am still too lazy to translate it). 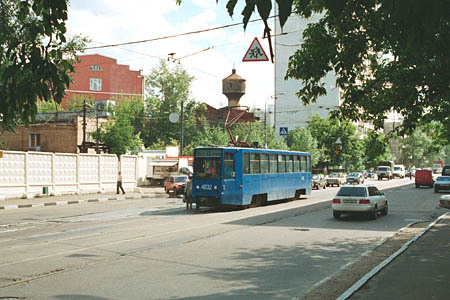 A railway branch crosses the street and the tramway tracks. 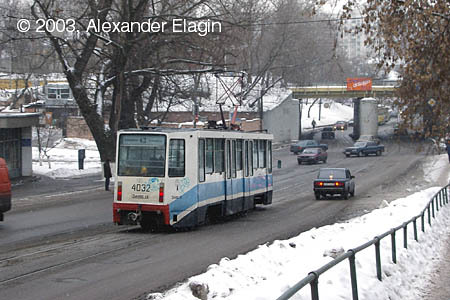 This is one of the few tram-railway level crossings in Moscow. 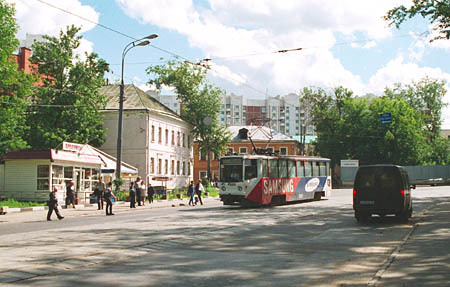 The last stretch of this street has typical residential buildings of 1970s in its western side and a number of the Defense Ministry institutions in the opposite side (including a large military hospital named after Burdenko).